With Bali’s stunning and diverse landscape, it's no wonder so many tourists flock to the island year-round. Exotic jungles, pristine beaches, vibrant sunsets, and volcanoes that love making international news - Bali has it all. Although every bit of the island is beautiful, hiking Mount Batur at sunrise remains one of my favorite activities. 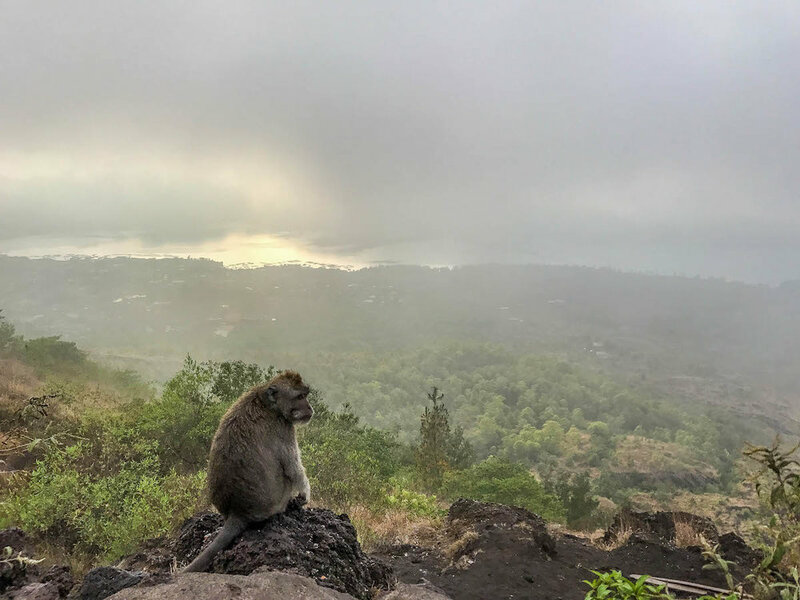 Here’s why a Mount Batur sunrise trek should be on your Bali bucket list, and tips for when you go. There are two active volcanoes, Mount Batur and Mount Agung, that tower over the island of Bali. The larger of the two, Mount Agung, made headlines in November of 2017 after erupting five times. It was the first big eruption since 1963, when Agung spewed smoke and lava 8-10 km into the air. An estimated 1,500 people died in the tragic 1963 eruption. It’s no surprise, then, that when Agung began rumbling in late 2017, the world went into alert. Thankfully, the surrounding area was evacuated before Agung eventually erupted in November of 2017. As I now write this in mid-2018, Agung is making headlines again. Although much less destructive this time around, Agung surprised the world with another eruption in June of 2018. Despite the negative media attention, island life remained largely unchanged in the midst of Agung’s eruptions. Apart from the evacuated areas in Agung’s immediate vicinity, Bali continues to be safe and open for tourism. And, unless Agung is on high alert, most tour companies continue to operate sunrise treks up Mount Batur. WHY WOULD I HIKE AN ACTIVE VOLCANO? The seriousness of Agung’s eruptions should not be minimized. However, I don’t believe Agung’s beauty should be, either. The Hindu island reveres its volcanoes and regards them as a dwelling place of the gods. Even in daily offerings, Balinese people incorporate small bamboo cones that symbolize and honor the sacred volcano’s peak. Although Mount Agung is not currently accessible to hikers, neighboring volcano Mount Batur is. 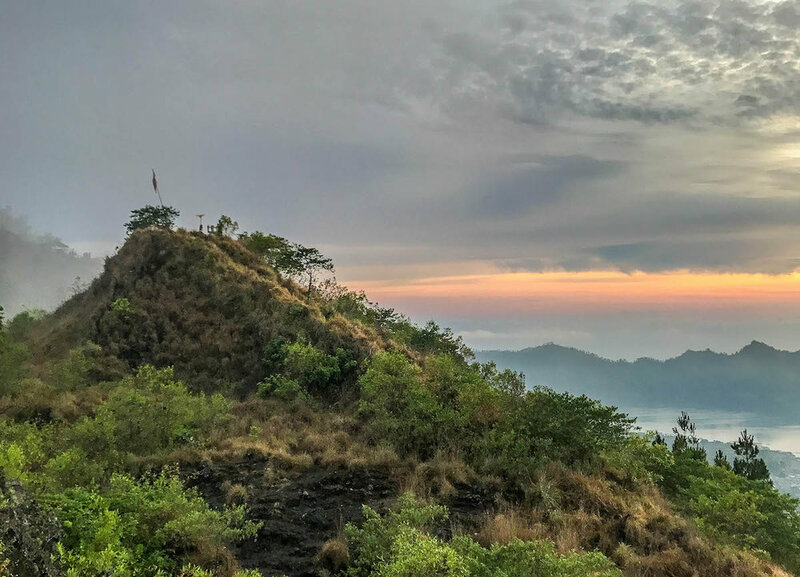 The most popular time to hike Batur is at sunrise. Tour companies lead hikers through the dark to Batur’s peak, culminating in epic views of distant Agung lit beneath a fiery sky. If you think Bali’s sunsets are incredible (and they are), just wait till you watch this sunrise. Imagine standing on the peak of an active volcano, looking onto another active volcano, as the sky comes to life in radiant pinks and oranges. There is no view quite like it. In November of 2017, Agung sent smoke into the air and earthquakes across the ocean. Many people ran as far away from the volcano as possible. Tour operators closed Mount Batur treks for a period of time. However, Agung’s high alert was eventually decreased, and tours reopened. Personally, I was relieved. Not only was this good news for the island*, but it meant I would be able to cross off my top Bali bucket list item. The day I learned tours had reopened, I contacted a guide and booked my volcano trek for the following morning. I was picked up from my Ubud hotel at 2:30am to begin the journey. Only a few others were sleepily waiting in the van. We all stopped at a small warung (or, possibly just someone’s home) on the side of the road in the middle of nowhere for food on the way. Breakfast was basic, including boiled eggs and sliced bread. As a treat, they brought out deep fried bananas which were quickly devoured, even at 3:30 in the morning. Back in the van, we drove another half hour before arriving at the base of Mount Batur. At least a hundred other hikers were there as well. It was chilly and pitch black: not the sunny tropical hike one might expect in Bali. We all bundled up in whatever layers we had and switched on our headlamps and flashlights. Through small streams of light we could see the path directly in front of us, and nothing more. The hike took about two hours and was not nearly as easy as I anticipated. Our guide had us take breaks periodically to accommodate some of the struggling hikers. Although I was in pretty decent physical shape, I definitely appreciated each of those breaks. I’m confident that most people could survive the hike even without much physical fitness, but don’t expect it to be a leisurely walk. The gravelly loop trail is a total of 7.6 km, reaching an elevation of 1717 m above sea level. For sunrise, there are two main viewpoints. You’ll first pass through a lower viewpoint, where you can buy snacks and tea to enjoy as the sky lights up. There is also a higher viewpoint, requiring an additional 30 minutes or so of hiking to reach. Which viewpoint your guide chooses will depend on the preferences of the group, as well as how quickly your group makes the ascent. You definitely don’t want the sun to rise while you’re still in the middle of hiking to summit. Because our guide thought we might not reach the higher summit in time, we stopped at the lower viewpoint. By then, I was starving. Thankfully, my hotel packed me a to-go breakfast that I ate while waiting. I was fully prepared to fight off hungry monkeys and fellow trekkers who visibly regretted not also bringing extra food. At 1717 meters altitude on a tropical island, you are, literally, up in the clouds. This of course means that, sometimes, the horizon is shrouded in a thick layer of fog. It was for us that morning, which was beautiful and eerie but also threatened to ruin our sunrise view of Mount Agung. Thankfully, just as the sun appeared, the fog cleared just enough to catch the breathtaking views. The sunrise was as radiant as I’d ever seen, in striking reds and oranges and pinks. Mount Agung lit up in the distance, sending a small plume of smoke into the sky. Sunrise was epic enough, but the journey wasn’t over quite yet. We continued onward, taking a break to feed the dozens of monkeys congregated on a flat section of the mountain. After taking photos in front of the summit marker, we then began our descent. The path down the mountain led us along the rim of a crater from one of Batur’s ancient eruptions. Pockets of hot sulfuric smoke puffed out of the earth keeping the monkeys at a distance. As we descended, the barren crater transformed into rocky mountainside and eventually into green gardens at the base of the mountain. My guide pointed out the vegetables that locals were growing out of the volcanic earth below. She waved at a schoolfriend who was already out working in the garden. It all seemed so very normal to be living on a smoldering volcano. After returning to the van, we began driving back toward Ubud. On the way, we stopped at a chocolate farm and sampled some sipping chocolate. To be honest, everyone was exhausted and ready to be back in bed rather than forcibly fed chocolate. We begrudgingly sat on the jungle terrace (which really would have been lovely if we weren’t sleep deprived and placed there against our will) until we were asked to return to the van to continue home. If you want to hike Batur, you will need a guide. Although it’s technically possible to hike Mount Batur without a guide, it’s not recommended. Not only does hiring a guide help support the local community, but without a guide you’ll miss out on all those interesting conversations about local life and culture. Finding the start of the trail is very difficult, and gauging volcanic conditions is near impossible without the help of an experienced guide. And perhaps most important, you’ll be persistently harassed by locals and the town mafia which, I’ve heard, have been known to become verbally and even physically aggressive with hikers attempting to make the trip alone. You’ll find dozens of Batur sunrise trekking companies with almost identical names listed on Google. Each company will take you on the same hiking trail, one group right behind another. You won’t be able to avoid other groups, because everyone will head up the volcano at the same time to catch the sunrise. So, you should focus on finding a company that makes the journey as comfortable as possible for you. Whether you go with Sunshine Tours or some other company, keep these tips in mind when booking your trek. Find a company that will pick you up and drop you off at your hotel. Most do this, but confirm before you book. You don’t want to try to find a taxi to drive you into the jungle in the middle of the night, and booking your own transportation could be expensive. Most trekking companies will pick up from hotels in Ubud, and some pick up from hotels located even farther away. Many of the trekking companies try to promote local coffee or chocolate farms or markets, adding these stops onto the ends of the tours. Although on a normal morning these activities might be enjoyable, after only a few hours of sleep and a strenuous hike, hours of coffee farm tours could be the worst thing imaginable. Some tours make several stops that can last a couple of hours after you’ve completed the hike. Yikes. Thankfully, our tour just added the one chocolate farm stop, and I still made it back to my hotel by about 10:00am. Check before booking your tour to see how many stops they make, if any, and choose your tour company accordingly. Most trekking companies will provide at least some basic food before beginning the trek. However, I did hear from some others along the way that they hadn’t been fed, and they were not happy about it. The morning is long and active, and even if you don’t feel hungry at 3:00am, you’ll wish you had filled up on eggs and toast before starting the hours-long hike. Although you can buy snacks at summit, the options aren't great, and I wouldn’t suggest relying on it for a meal. Although you won’t be able to avoid hiking alongside dozens of other trekking groups, you can have some control over the size of your own group. Fewer people in your group means fewer people to wait on during breaks, and less likelihood that stragglers will impact your pace or keep you from reaching the higher summit. I decided to do the trek on my own, but didn’t want to pay for a private tour. Private tours for solo travelers are much more expensive than the per person cost of a group tour, even though you’ll get no added privacy. In my opinion, private tours are simply not worth it. I had to call several companies before I found one that allowed me to join an existing group. I saved a ton of money this way and had an almost identical experience as I would have if I had paid for the private tour. A spot on a group tour with Sunshine Tours will cost roughly IDR 350,000 (about USD $25). A private tour, depending on pick up and drop off location, will likely set you back over IDR 1,000,000 (about USD $70-100). Although most tour companies provide all the basics you'll need for your trek, it doesn't hurt to be extra prepared. I saw lots of hikers around me struggling because they didn't have proper footwear or because they forgot to bring a snack. These issues are all easily avoidable so don't let them interfere with having the best experience possible. Follow these tips to ensure that you get the most out of your trek. Don’t underestimate the trail’s difficulty. I’d recommend wearing proper hiking boots. At the least, wear a good pair of sneakers with grooved soles. I saw some girls wearing booties or even sandals, and they were slipping and falling the entire time. It was sort of ridiculous, definitely dangerous, and held up everyone else on the trail. You’re on a nighttime volcano trek — there’s no need to be fashionable. Also be sure to dress in layers. At the start of the trek, you’ll be chilly and will probably want to be wearing pants and a jacket. Once the sun starts to rise and you work up a sweat, you’ll be grateful to shed some layers to cool off. Bring a backpack to store your jacket when you don’t want to wear it anymore. Your trekking company will likely give you a water bottle at the start of the hike, but it’s really not enough to last the entire morning. The hike is long and fairly difficult, so bring at least one other water bottle (I’d suggest two) to stay hydrated along the way. I was also incredibly grateful that my hotel gave me a boxed meal for the trip. By the time we reached the summit, it had been 3-4 hours and many, many calories since we’d last eaten. Be sure to have an energy bar, fruit, or some other sustenance to re-energize. Try to avoid packaged food, as trash on the mountain is a problem. If you can’t avoid it, then just be sure to carry your trash down the mountain with you to dispose of when you get home. I think I’m an anomaly in how much I love the Bali monkeys. Sure, they’re aggressive jerks with no sense of personal space, but I still think they’re cute. Expect them to be everywhere, and if you have lots of extra food or leave it sitting next to you, they will come and steal it. Because I knew the tour company would provide a flashlight or headlamp for me, I didn't bother bringing one. This was a mistake. The flashlight they did give me was so dim that I could hardly see more than a few feet ahead. And, because of how slippery the trail is, carrying a flashlight wasn't very convenient anyway. I'd recommend bringing your own hands-free headlamp. Most companies will still operate tours even if it's raining. Much of the trail is steep and covered in dirt and loose gravel. During heavier rains, the trail can become extremely muddy and slippery. This can not only be dangerous, but also highly unpleasant. And, in this weather, it's unlikely that you'll have a nice sunrise or a proper view of Agung. If possible, give yourself some room to reschedule the hike for a later date if the weather is bad. If you absolutely can't reschedule your trek and its raining, reset your expectations. Know that you will get muddy and cold, and the views at the top are not guaranteed. Definitely wear proper hiking boots to avoid slipping and falling on the trail. If you can enter into the trek with these expectations, you can avoid letting a bit of rain ruin your experience altogether. In fact, it may even be fun to get a little dirty. I was shocked to see how many hikers stuck to themselves and didn’t chat with their guides along the way. Many of the trekking guides have grown up in the area surrounding the volcano. They have some incredible stories to share about that way of life. Some might even have families who were around for the eruption of 1963. No information in a newspaper can come close to the insight you’ll get from hearing a local's firsthand account of this. Not only are these conversations rewarding for you, but they also can really help the locals practice their English. My guide was so appreciative that I chatted with her on the hike. Amazingly, she learned how to speak English solely from conversations she had with hikers on her tours. Now, her English is close to perfect. As a young student with dreams of going to university, she made the trek up Batur every single morning to earn money as a guide to pay for schooling. Now she is hopefully that her English language skills will open up future opportunities for her. Hiking Mount Batur for sunrise remains one of my favorite activities I've done in Bali. It is one of my top recommendation for visitors. 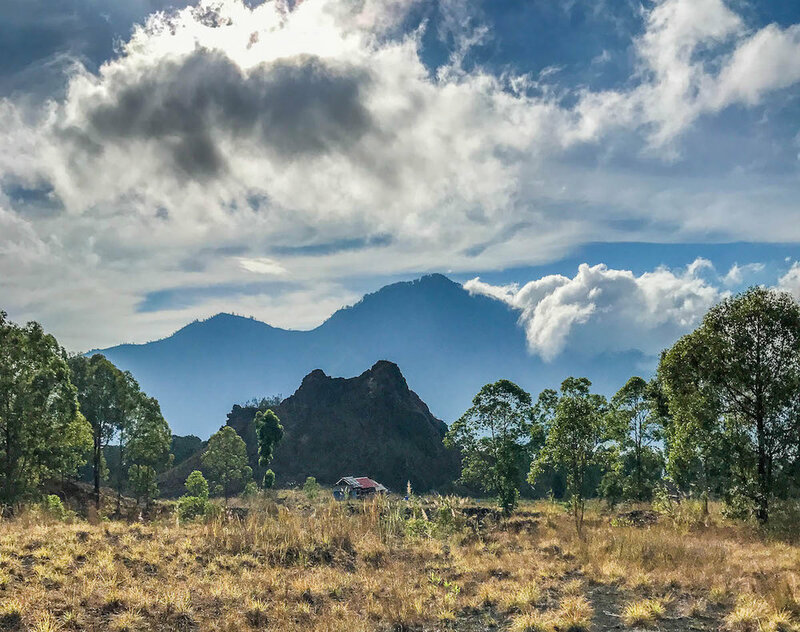 With all of the negative media attention surrounding Bali's volcanoes, it could be easy to miss the opportunity to really soak in and appreciate their beauty. I hope this guide has been helpful in explaining how to plan your trek and have the best experience possible! If you have any questions about trekking Mount Batur, leave them in the comments below.